Are you ready for the Super Bowl? 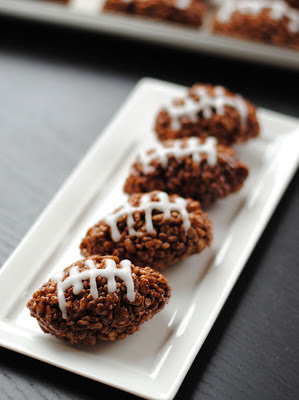 It's mere hours away, but I'm still adding new things to the menu, like these football Rice Krispie treats, made with real unsweetened chocolate. My mom actually made these this weekend for our Super Bowl party, but the man and I devoured them before I had a chance to take any pictures. (I know - we're the worst and have zero impulse control). But I recreated them, and here they are for you in all their glory! They take all of 15 minutes to whip up and require no baking, so your oven can be free to bake wings, pretzels, or absolutely nothing. In a very large saucepan (I used my dutch oven), melt the butter and chocolate over medium/low heat. Add the marshmallows and stir until melted and evenly mixed. Remove from heat, and stir in the vanilla. Add the cereal, stirring until evenly coated. Allow to cool for 10 or so minutes while you line a large baking sheet with parchment paper. Using wet hands, scoop 2-3 tablespoons of the mixture and roll into a ball between your palms. Shape into a football and repeat for the remaining mixture. To make the glaze, whisk together the icing sugar and water in a small bowl. It should have a stiff consistency, so if it's too watery add more icing sugar. If it's too stiff, add 1/2 tsp of liquid at a time. Using an icing bag with a small circle tip, or a sandwich bag with a corner cut out, gently pipe the icing onto the cooled football treats in the shape of football lacing.